Yesterday evening I visited a parish where a group of people with intellectual disabilities were preparing for an inclusive Mass. The Sunday gospel of the Transfiguration was going to be acted out, after which a central, simple message would be imparted: Listen to him. And it occurred to me that this is the message which can so easily be lost, amid all the dazzle and brilliance, the clouds and voices, the prophets and proclamation of God's Beloved. But this was the message God wanted us to hear. Listen to him... in prayer and in scripture, but also in everyday life. Listen to him... present in events and in people, in the news and in workplace conversations, in the hesitant blossoming of spring and in the vivid dying of autumn. Listen to him... amid the dazzle and the clamour; discern his voice among so many others. Listen to him... very especially, when his voice is barely a whisper, or when his words are a discomforting challenge; a call to love, to forgiveness, to reconciliation, to surrender. Listen to him... even when he seems to be asking more than we feel we can give, when he is calling us to something bigger than and beyond ourselves. Listen to him... and keep listening, not only when you're in the mystical heights, but especially in flat times, in ordinary places and on rocky paths. Listen to him, be open and trust. NB: I took this photo this morning. 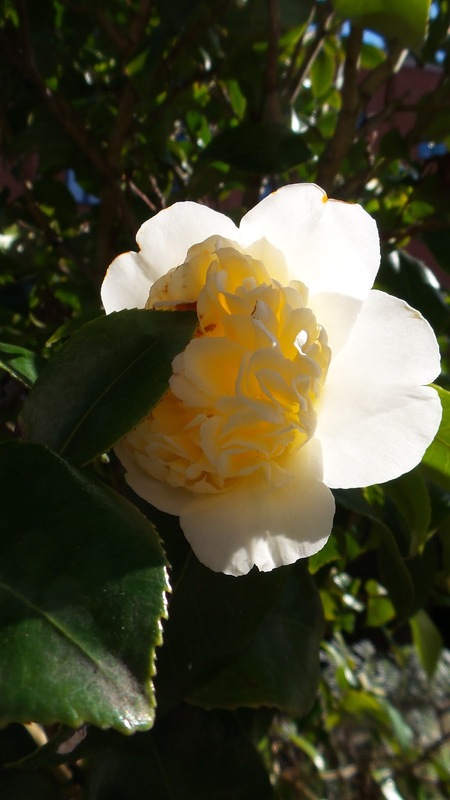 The weather is icy cold, but backlit by the cold sunshine, this somewhat premature camelia is enjoying its own moment of dazzling brilliance!